With daytime temps lingering in the mid-fifties this week and chilly nights ahead, I decided yesterday that it was time to pull up the vegetable garden. 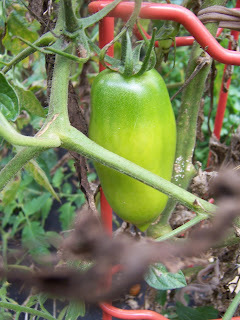 Although there were still green tomatoes on the San Marzano plants and while both the flat-leafed parsley and the sweet basil were still viable, I know it’s only a matter of time before they get nipped by the frost. It wasn’t a great year for the garden – I was out of town for long spells, lazy when I was in town, and the lack of rain really hurt the developing plants. My heirloom tomatoes didn’t do well at all, although I got plenty of sauce tomatoes from the San Marzano and lots of snackers from the grape tomato plant. I picked about a half dozen of the green tomatoes (fried green tomatoes are always good, although these might be a bit too green) and then started pulling up the plants. Tomato vines always smell so good – their pungency scent always says summer to me, and I love the way it lingers on your hands. Next I yanked up the parsley and the basil. The basil had gotten stalky but it still smelled wonderful as I uprooted it. 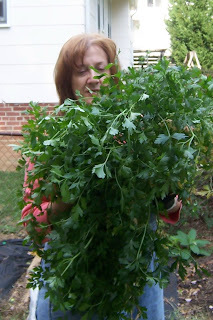 I had an huge bouquet of parsley when I pulled it up – the lack of rain didn’t seem to hurt it a bit. It seemed a shame to toss it but I have dried and frozen parsley galore, so into the bag it went, along with an errant bean plant that unexpectedly showed up last week and the remains of the watermelon vine – all that’s left of the garden. I dug up the potatoes several weeks ago; a disappointing crop of about two dozen smallish spuds out of four plants, none of which did terribly well. I still haven’t quite gotten the hang of this potato planting business but will try again next year. The cucumber vine has long since withered away and I pulled up what was left of the beans a while back as well. After I bagged up the organic refuse, I began pulling up the weed block that I lay down every year (because, as previously mentioned, I am a lazy gardener). This stuff has served me well every year – it’s inexpensive, water permeable and forms a nice barrier between the weeds and my nice tilled garden soil, while acting as a mulch to help the plants retain water and warmth. I peg it down with green plastic pegs, which are great because I can reuse them year to year. I probably have sixty or so and I think they’re on their third season. I used to use metal staples but they rust and are easy to miss when doing the fall cleanup, so I’m glad I found the green plastic ones. I popped them into a bucket to rinse and put away, and bundled up all the plastic weed block to go into the trash can. these ones this year. I bought five of them and was extremely happy with the results. They didn’t sag or buckle under the weight of the plants the way the cheap funnel-shaped metal ones do, and I was pleased to note when I stacked them that they looked as good as they had. You can get them in green but I liked the cheery red version (you can see a bit of one in the picture at the top of this post). After I finished raking the garden smooth, I took a turn around the back yard, looking things over. 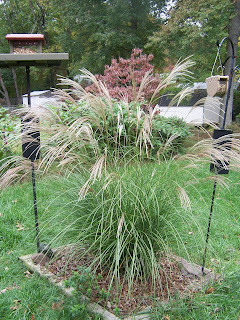 Those of you who have been reading this blog a while may remember last spring, when I divided an enormous sawgrass plant that was taking over my ornamental garden. 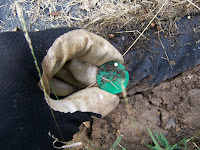 This photo is of one of the three divisions I transplanted, and by far the most successful. The tray on the birdfeeder to the left is about six feet up, so you can see how tall this plant got over the summer. It’s every bit as big as the original plant. I gave one of the other sections to my buddy Stephen but keep forgetting to ask him how it’s doing. 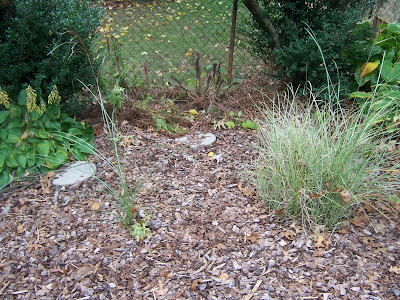 I put another section in a plot in the front yard, where it’s struggled throughout the summer. The original plant also didn’t do so well this year, either, although it did surprise me by producing a little offshoot. In the photo below, the original plant is on the right; the little surprise is to the left, looking a bit like stray moustache hair. I’m at a loss to explain why the one section thrived so and the others just sort of did the best they could, but as I’ve often said, all gardening is an experiment. It will be interesting to see what happens when spring rolls around again. Will the plant in the front yard do better? Will the little surprise show up at all? No telling what’s going on under the ground.